Find piano benches, lamps, digital keyboards, sheet music and accessories. When was your piano last tuned? One year ago, two years, five years(gasp! ), ten years(double gasp!! ), or more(triple gasp!!!). A piano must, I repeat MUST, be tuned every year to stay in good shape. Two or three times a year to stay in tip top tune and excellent working order. O. K. I know many of you don't care about tip top tune. But please for the sake of that beautiful and expensive (now days you can put an emphasis on expensive) piano get it serviced at least once a year. Think about this. The average cost of a tune up all across the US is around $135. Divide one hundred thirty five dollars by 365 days. That's only thirty seven cents a day! What can you buy for only 37 cents? Maybe a tiny piece of bubble gum. Your piano is worth a whole lot more than bubble gum! Even if you think you can't hear the difference, your piano needs tuning. Why not get it done? I am a piano technician and player who really cares about this business and one of the most wonderful instruments of all time. YOUR PIANO! We hope your experience here is enjoyable. Taking care of your musical needs online is fast and easy. Shopping on the web saves gas, and your order is shipped right to your door step. Please note that all orders on our site over $85 include FREE SHIPPING! And, on a few select items under $85 we will ship free!! Search for a variety of quality, inexpensive piano benches, lamps, and accessories . We offer a source for piano sheet music, plus music for guitar, organ, violin and other instruments. You can also save big on Christmas Sheet Music all year long. Many of these items make wonderful gifts for your family or friends. Our growing list of products includes Schaff piano tuning supplies, GRK adjustable artist bench, and Jansen benches, stools, and accessories. The GRK sheet music cabinet is a lovely accessory and please view the beautiful House of Troy piano lamps. These quality lamps can also be used for desk lighting. We have piano bench cushions, (sometimes called bench pads) which will prevent scratches and give added comfort to your playing enjoyment. Musicians and beginning piano tuners can purchase tuning hammers plus other piano tuning tools, supplies and parts. For the digital piano player we offer a source for purchasing electronic keyboards and accessories. You will find an excellent selection of digital keyboards, whether you are a professional musician or just a beginner. And if you are looking for a child's gift, please view the "Schoenhut" toy piano page. Kids will have hours of fun playing with these unique instruments. You may also enjoy our Schoenhut Picture Gallery. Please browse each category on the left for the items you are interested in. And if you do not see what you are looking for, please call or email us. We may be able to get the item you are looking for. Have you ever asked "How old is my piano". Find out now. Send us the serial number and name to find out how old it is. We can determine the age of about 95 per cent of all pianos made world wide. Please note that our sheet music source has more selections than you will ever find in one place. Shopping on line is great! Search for rock, jazz, classical, ragtime, blues, gospel, band and choral sheet music for piano plus all instruments. The GRK keyboard bench is currently on sale! It is our lowest priced piano bench. We also offer the Yamaha X-Style portable keyboard bench. This light weight accessory folds up and is easy to carry. It can be used with any electric keyboard or simply as a portable seat. More accessories offered are a keyboard stand, soundboard cleaner, fallboard lock, caster cups and the deluxe Sav-A-Rug. You should spend a little time on our site looking at more than just the home page. This site offers much more than just piano benches or lamps and accessories. We are continuously updating and adding more products, information, history, facts, valuable tips plus free info on piano care and piano tuning and repair in Memphis Tenn. and Shelby county. Be sure to bookmark any page or pages that you are most interested in. The piano making industry has seen drastic changes in recent years, while the instrument itself remains basically the same. Sorry to say, the piano manufacturing business in America is almost dead (2017), but the love of the instrument may be as great as ever! It's just that now days while almost everyone loves a piano very few people can afford a new one. Read our Piano Facts page about recent prices and production numbers. So I say buy a used piano. There are still a whole lot of them out there. Find them listed in the newspaper, on the web, on the street(yes it does happen, probably because of all those foreclosures and job losses over the past few years), etc. That's it! Save a piano. Seriously though, be careful about picking one up off the street. It might have a disease! Just kidding. Although, it would be a very good idea to clean the keytops and case. Lightly wipe the black and white keys off with a disinfecting wipe. Don't let any wetness drip inside from the sides of the key, and then wipe off with a clean dry paper towel or cloth. If there is a bench, clean the top and the inside. Another important fact is this. One single thunderstorm can completly ruin a piano. No matter how good it is. Plus if the instrument has been thrown out something may be wrong with it. Check to see if all the keys and action (the insides) are all working and have not been water soaked. It is no good if the action gets wet. An action contains mostly wood, felt and glue. A small amount of rust on the steel strings and pins can be tolerated, but that's about it. If the wood keys are water soaked, they will dry out but will most likely warp and lose their felt bushings. Let me say further, that I only talk about this free method of finding pianos on the street because as a piano player and technician for over 30 years it saddens me to know that many of these abandoned instruments may wind up in the dump. I know most people are not all that thrilled over the idea of picking up a piano off the side walk but a lot of them can still be used to at least give your child beginning piano lessons. If they do well, later buy them a new one (if you can) or a newer and nicer used one. There is a chance that a few of these discarded "king of instruments" may be of very good quality. As the economy gets better there won't be as many free ones anymore so typically a referral from a piano teacher, close friend, neighbor or relative will be the best source for a good piano, new or used. And don't forget the bench! Here's an after thought. Recently I have realized that many of those free or cheap spinets were not all that good in the first place. Plus the big old uprights and old grands are all getting so aged and decrepit that they no longer perform well. Not to mention most of them will not tune up very well at all. Now, please don't get me wrong. I'm not contradicting what I said above about salvaging one of those discarded instruments. But, the truth is, a badly playing and sounding piano may actually discourage your child. Or even worse it may turn them off of music altogether! As an alternative, (Forgive me God. After all I am a piano tuner and lover.) just mayyyybe an electronic keyboard could also be a good choice. After all they have gotten much better these days. And of course, for a real piano student, I only recommend a "digital piano". Not a cheap electric keyboard. Digital and electric mean the same thing, but digital piano and electronic keyboard do not always mean the same thing. Even though both terms are used for describing a keyboard. An article at the bottom of our Digital Piano page may be helpful to understand this.I particularly enjoy the Roland RD-300GX, found on our digital piano page. It plays and sounds really good. Ah, but now we are no longer talking cheap, as in a free spinet piano sitting on the curb. Now do you see what I'm talking about? I hope so, because it's all about giving your child the best chance possible to do well with their music studies. The instrument they play on must be good enough so that they will not be hampered by any possible inadequacies of the instrument. This means that if you do pick up a cheap or free spinet you must have it tuned and adjusted to sound and play as good as possible. If this can not be done then you must spend $10,000 for a new Kawai studio piano or around $2200 for a Roland RD-300GX digital keyboard and speakers!!! Just kidding, but only a little, since I love high quality stuff. I realize of course that these might not be in your budget so there is nothing wrong with dragging that free spinet into the house. Now I'm sure you see where I'm coming from!! Have fun! The world of music is an exciting place. From John and Daisy at The Piano Tickler.com Your online source for piano benches, lamps, accessories, tuning services, tools, sheet music and much more. 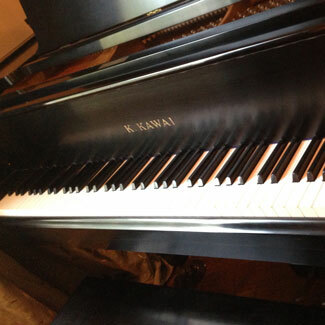 We have tuned and repaired pianos in Memphis Tennessee since 1976. We also service Germantown, Collierville, Bartlett, Arlington and Lakeland Tennessee. We will travel to all surrounding counties and beyond. Concert piano tuning by ear! NEW PIANOS ARE BEAUTIFUL INSIDE AND OUT. A WELL CARED FOR USED PIANO CAN ALSO LOOK GREAT. THE MUSIC OF THESE WONDERFUL INSTRUMENTS HAS BEEN ENJOYED BY BILLIONS OF PEOPLE FOR MORE THAN 200 YEARS. Well, if you want to be upright or grand, you surely should know the difference. That is, between the two types of pianos. I mean, seriously now. The upright piano is also referred to as a vertical. It stands up, so to speak. A grand piano is horizontal and lays down. But it's not really laying down, since three legs (four on old square grands) are supporting it. The strings and cast iron harp or plate inside are horizontal in a grand and vertical in an upright. The cast iron plate in both types looks about the same. With grands there is a more curved shape and closed in design , giving them a more attractive look than uprights. Which is good, because with the top raised, you can see inside of a grand. Verticals are closed up and do not allow an inside view. Now, don't misunderstand. The plate in a G.P. is not necessarily made just for looks. It is designed to give the instrument greater strength and tone, and because of the way the sound board is shaped, a G.P. utilizes a greater portion of it's sounding board than a vertical. With the lid propped open, the sound goes out into the room and carries farther than an upright.The piano action in a G.P. is made different than in a U.P. Grand actions contain a repetition lever which allows greater speed than an upright action, which does not contain a repetition lever. This speed is noticed mostly by concert musicians only. Let's face it. The average player (no matter how many piano lessons they have had) will hardly notice the difference. Another important difference in a G.P. is that the dampers are able to cut off the sound of the strings closer to the striking point than an upright. A grand piano is also more easily equipped with a working sostenuto device. The sostenuto is activated with the middle pedal. It may also be referred to as selective sustain. The soft pedal (the one on the left) is much more useful in a G.P. than a vertical, because it softens the sound without affecting the feel of the keys. The pedal on the right is called the sustain or damper pedal. It does the exact same thing on both types of instruments. When depressed, it lifts all of the dampers to let the sound ring on. With the damper depressed, you had better make extra sure that you play only the right notes or it will sound terrible! But now, that's what piano lessons are for. Find a good teacher. Last, but not least, another big difference is the price. Grands cost a lot more than verticals, although it does depend on the brand of the vertical, because a new or used Steinway upright will cost more than lower priced new grands. But if we are talking about just the difference in price between lower to average quality (Chinese instruments will fall in this category), the price for an average vertical is about half of what a G.P. might cost. The price difference may be much greater if you are talking about used instruments. In other words, a used spinet, for instance, may cost much less than a used G.P. Well, that's about it, except for the piano bench. Quite often on newer pianos, you can't see much difference in the size or shape of the benches. With older instruments, sometimes a grand bench is longer than an upright's. Then, again. I have seen some used verticals with a bench as wide as a grand piano bench. Check back later to learn more about "The King of Instruments" as it used to be called over a hundred years ago. There is so much interesting history and facts, collectibles, trivia and technical stuff about "The Piano"